Homeland Security's Nuclear Fallout Guidelines Include Warning About Conditioner : Shots - Health News That advice came in guidelines issued to residents of Guam on how to prepare for a missile threat on the island. The reason is conditioner can trap radioactive particles in strands of hair. The Homeland Security website Ready.gov warns that following a nuclear blast, you should wash your hair with shampoo but not use conditioner, because conditioner can bind radioactive material to your hair. If, for some reason, you find yourself in a situation where you need to wash radioactive material from your body, don't reach for the bottle of hair conditioner. Conditioner can bind radioactive particles to your hair. That warning was part of guidelines issued last Friday by Guam's Office of Civil Defense, following threats from North Korea that it was preparing to test a missile that would create an "enveloping fire" around the U.S. territory. On Tuesday, North Korean state media reported it would not carry out the test after all. Still, the guidelines, which also include information on how to take cover before an explosion, are correct. They're the same guidelines posted on the U.S. Department of Homeland Security's website, Ready.gov. The reason conditioner can be dangerous has to do with the physical characteristics of human hair, the chemistry of hair conditioner and properties of nuclear fallout. When a nuclear warhead detonates, a fireball incinerates everything it touches and hurls the vaporized material skyward. Buildings, rock and living things are turned to dust and get mixed up with the radioactive byproducts of uranium or plutonium atoms splitting. This dust, called nuclear fallout, leaks a steady stream of dangerous radiation. If you're unlucky enough to be caught outside during or after an explosion, fallout can settle onto your clothing and skin. Some of these particles are so small they can slip into crevices that lie open on strands of human hair. If you look at a strand of hair in a high-powered microscope, you'll see proteins that look like overlapping scales. "It can come apart during the day like a pine cone," says Andrew Karam, a radiation safety expert who consults for government response teams. "Radiation contamination particles can get between those scales." If you shower carefully with soap and shampoo, Karam says, the radioactive dust should wash right out. But hair conditioner has particular compounds called cationic surfactants and polymers. If radioactive particles have drifted underneath damaged scales of hair protein, these compounds can pull those scales down to create a smooth strand of hair. "That can trap particles of contamination inside of the scale," Karam says. These conditioner compounds are also oily and have a positive charge on one end that will make them stick to negatively charged sections of a strand of hair, says Perry Romanowski, a cosmetics chemist who has developed personal hygiene formulas and now hosts "The Beauty Brains" podcast on cosmetics chemistry. 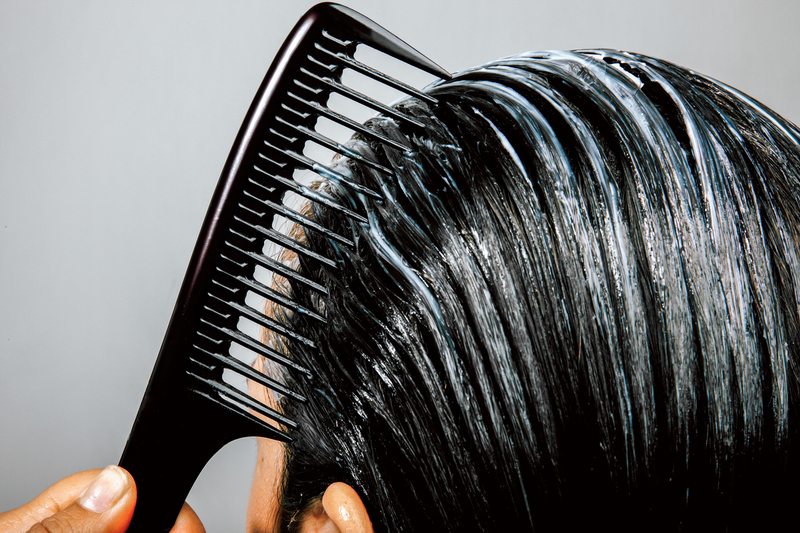 "Unlike shampoo, conditioners are meant to stay behind on your hair," Romanowski says. If the conditioner comes into contact with radioactive material, these sticky, oily compounds can gum radioactive dust into your hair, he says. For that matter, Romanowski says in the event of a nuclear blast, you might want to consider forgoing most personal care products that are sticky or oily. "Skin lotions or moisturizing lotions or color cosmetics that have oils — these go on your skin and can attract dust or radiation particles from the air. So that would be a concern," he says. It's hard to know exactly how damaging using hair conditioner following a nuclear disaster would be, Karam says. But he says that a basic principle is to do anything you reasonably can to lower your radiation exposure. "It's a very minor thing to give up using conditioner for a couple of days. Just wash with shampoo until the radioactivity is washed out," he says. Karam, who served with the U.S. Navy as a chemistry safety control officer aboard the attack submarine USS Plunger in the 1980s, says that regular washes with a simple soap or detergent should be enough. "I got a lot of skin contamination on the sub. Most of the time, I could clean it up with soap and water in five to 10 minutes. We assumed two to three washes would take care of it," he says. "Radioactivity is like changing a diaper. You don't want it on you, but if you do get it on you, just wash it off and go on with your day." The most important thing to remember when it comes to radioactive fallout is to try not to get exposed at all, Karam says. Radioactivity is dangerous and lethal at high doses. How much radiation you receive depends on a lot of factors, including how far away from the blast site you are, and whether or not you're in the path of the wandering plume of radioactive ash and dust from the explosion. A fallout shelter is best, but a basement may do in a pinch, Karam says. "If you see a flash, go inside right away," he says. It could save your life.